Walnuts are one of the major crops in the Greater Daglan Area, and a tasty treat they are. If you’ve been wondering how this year’s walnut harvest has been going, don’t fret. It’s going very well, and very quickly to boot. On Thursday, for example, I went out for a bike ride in the afternoon and came across all sorts of walnut-harvesting activity; unfortunately, because I had neglected to carry my trusty camera, I couldn’t provide you with any photos. 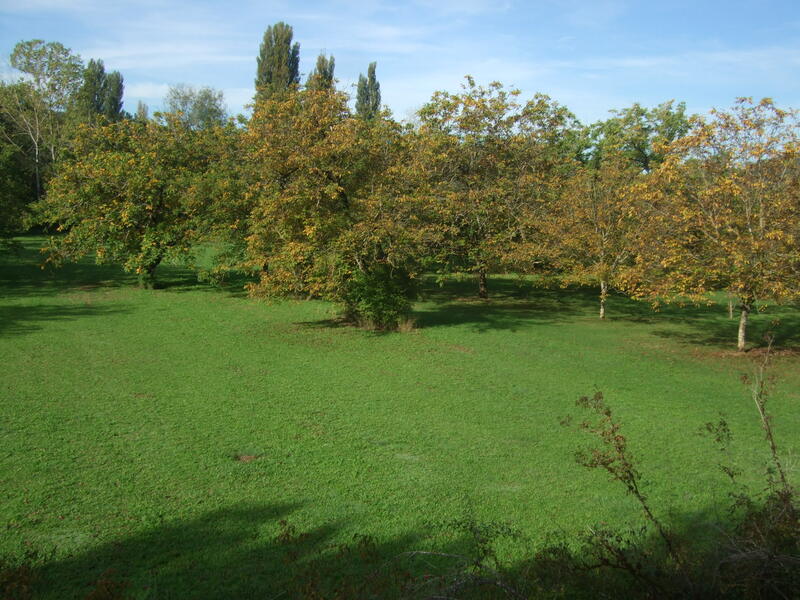 Walnut trees in a grove just outside Daglan. 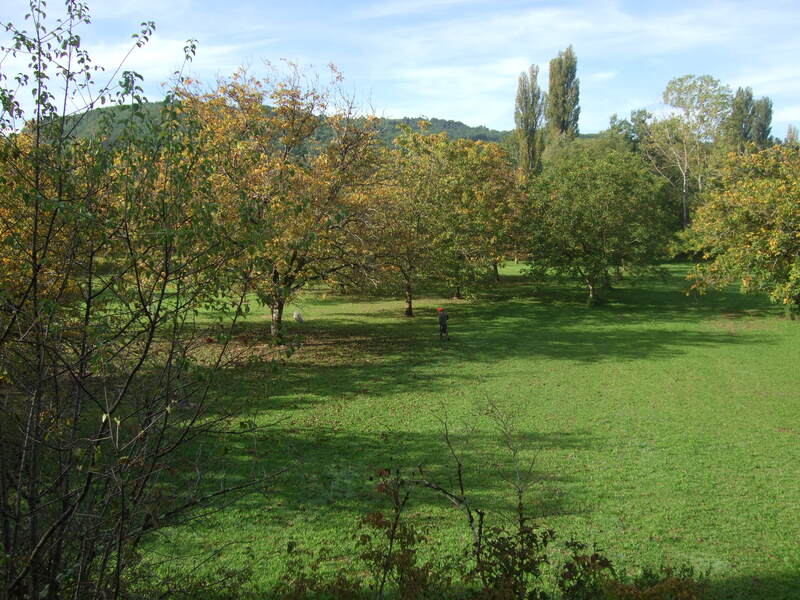 In this next photo, you may be able to spot the individual who’s searching for walnuts — he’s in the centre of the picture, wearing an orange cap. Look for the man with the orange cap, in the centre of the photo. Yesterday, our harvest-spotting luck improved dramatically. 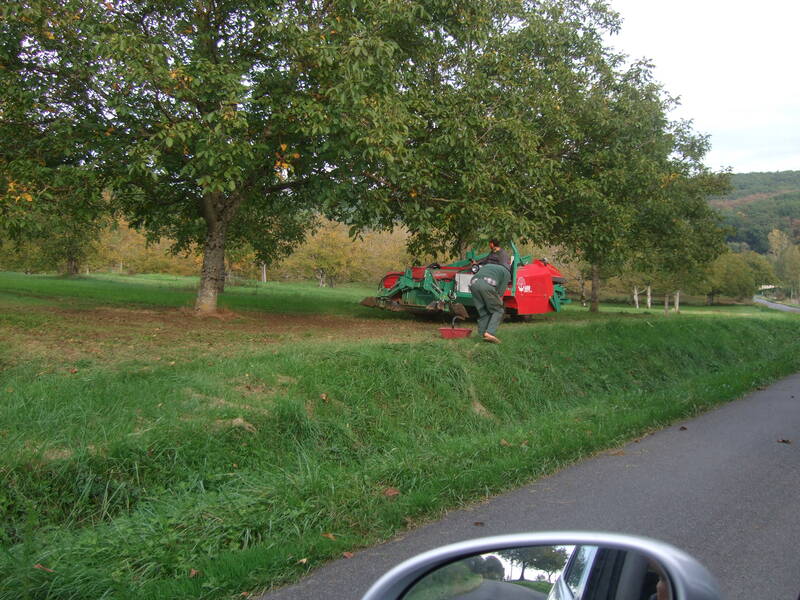 I was driving with my wife Jan up towards St. Laurent-la-Vallée (on our way to get a pumpkin for our Halloween jack-o-lantern) when we came across a team of two men, harvesting walnuts the mechanized way. 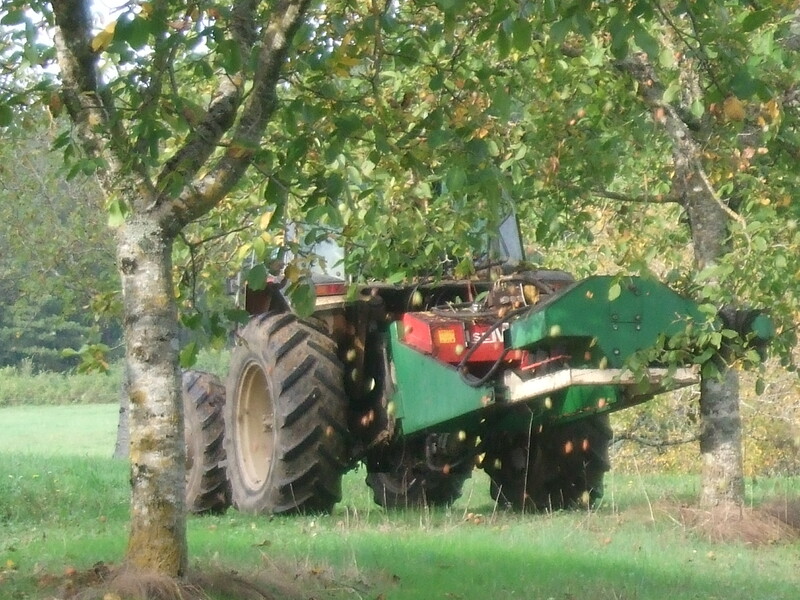 The tractor is getting into position near a walnut tree. There’s a whole lot of shaking going on! 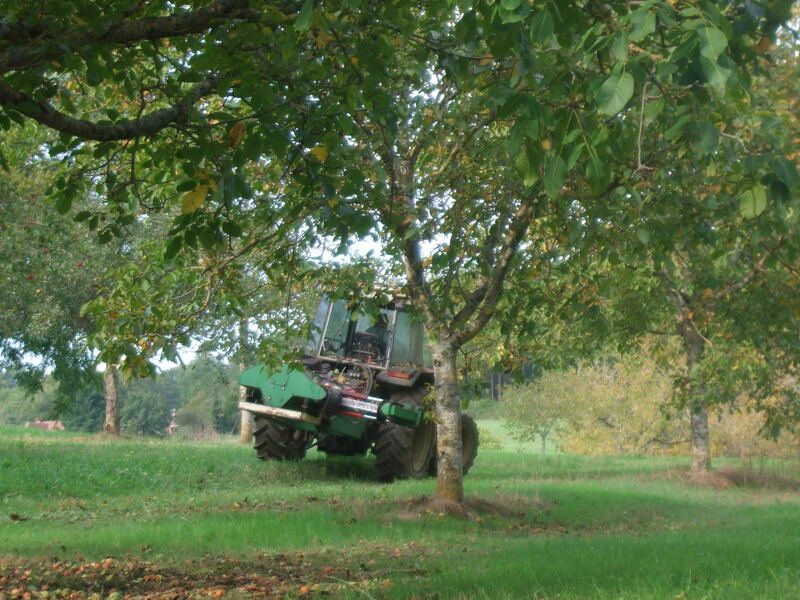 Two ways of picking up walnuts — by hand, and by machine. And here’s a closer look at the mechanical harvester. 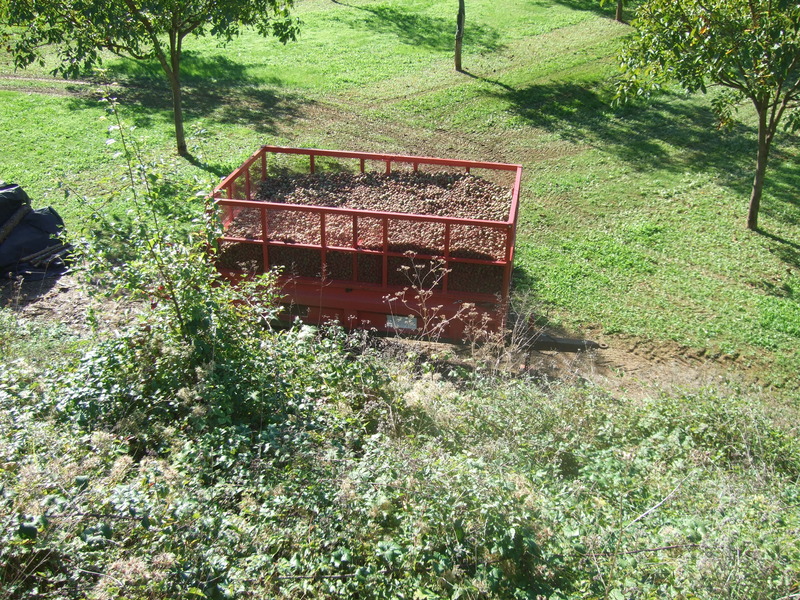 You may be able to make out the two rotating brushes at the front of the machine that sweep up everything into the machine, which then uses a conveyor belt to move the walnuts along into a storage bin. 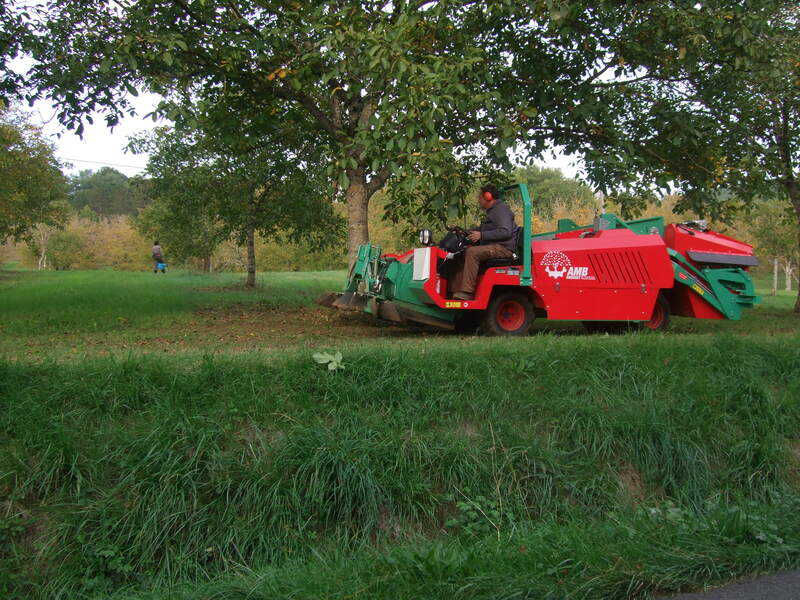 The mechanical harvester is sweeping up the fallen walnuts. A nice load of walnuts. So it looks to me like the bulk of the harvesting is done. Next step is to get the nuts into a walnut cooperative for processing. And after that? Walnuts as snacks, walnuts in cakes, walnuts in salads, and walnuts in candies. Oh yes, and walnut oil — delicious on salads. This entry was posted in Agriculture in the Dordogne, Flora and fauna, Life in southwest France, Weather in the Dordogne and tagged bicycles, bicycling, cycling, Daglan, Dordogne weather, nature, plants, St. Cybranet, St. Laurent la Vallée, walnut harvesting, walnuts, weather. Bookmark the permalink. 4 Responses to Walnuts — You’re going down! Interesting post, Loren. I had no idea they just shook the tree to harvest them. I’ve heard that actually makes trees grow faster. We used to have a big walnut tree in our back yard in Port Credit and all we got was a rainstorm of blackened husks when the squirrels got at them each year. Thanks Paul. Yes — there really is a whole lot of shakin’ going on, around the GDA. There used to be a saying/folklaw/advice in UK – ‘A woman, a dog, a walnut tree. The more you beat them, the better they be!’ There might have been some truth about the whacking of a walnut tree, but I think the other two were well off the mark. Ouch — that’s quite the expression, Lesley. It’s probably not too current now, in Politically Correct England!